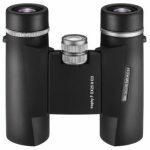 The Trophy D 8×42 ED by Eschenbach look like your average roof prism high-end binoculars, but upon closer inspection, you’ll notice that there are a number of difference that have a major impact on the overall quality and viewing experience these top selling binoculars offer. These binoculars are easy to use and adjust. Unlike competing models, they allow for precise adjustments, which is a big plus for beginners. Ultimately, the Trophy binoculars are a great buy for a wide range of applications, although they may not be the best choice for birding. To start, the binoculars feature a thinner single bridge design, compared to standard binoculars that often have a meatier bridge. The Trophy’s top hinge design provides more space on the lower portion of the barrels, this results in a much larger area that allows for improved user grip. The ends of the barrels also feature a design that’s different from the norm. The ends of the barrel are not perfectly circular. Instead, the rubber armor coating has been molded to provide the barrels with a more ergonomic shape that not only adds to the aesthetics but improves the grip by providing a nice ridge you can hold onto. Many birders have reported that these binoculars can be uncomfortable to use for a longer period of time. This is due to the combination of the smoother rubber armor and thin eyecups. If you’re looking for binoculars specifically for birding use, we recommend the Vortex Optics Viper HD compact binoculars, which are equipped with thick eyecups and a more ergonomic design. The binoculars feature housing that’s made out of magnalium, a type of aluminum and magnesium material that also contains a small amount of tin and nickel. The magnesium makes the aluminum lighter and easier to work with because it’s less dense, making it a better option than binoculars that use pure aluminum housing. It comes as no surprise that these binoculars are waterproof and fully sealed, a design feature that’s offered by most high-end models of compact binoculars. Since they’re fully sealed, the inside of the binoculars is protected against moisture, dust, dirt, debris, and more. The inside of the lenses is also nitrogen purged, which will prevent condensation from forming on the inside. The exterior is covered in a thick rubber armor designed to protect the binoculars in the event of a fall. The surface of the rubber is not texturized, instead, it’s entirely smooth. While this design looks appealing it takes away from the gripability of the binoculars. Additionally, the smooth surface is more reflective. If you need binoculars equipped with a more durable and grippy casing, click here to read our compact binocular’s buying guide which includes five of the top selling models of compact binoculars. To attach the binoculars to a tripod, simply unscrew the dust cover located on the front of the bridge. The eyecups are very large, but while the eyecups look heavily padded, the coating is actually thin. Unfortunately, they’re not the most comfortable eyecups to use. How to focus binoculars is made simple with a focus wheel that turns smoothly, with no free play or sticking points along the focus plane. The wheel makes smaller adjustments and requires 1 ¾ of a turn to go from one end to the other. It’s a nice compromise between the ability to accurately and easily make small changes and the speed of making large focus adjustments. Measuring in at thirty millimeters, it’s not the biggest focus wheel, but the deep jagged metal ridges found along the circumference are excellent, providing the user with the right amount of tactile feedback and plenty of grip. Just like the focus wheel, the diopter ring is metallic. It also has jagged ridges that provide the perfect non-slip surface that allows for faster, easier adjustments. The ring is not placed in the usual spot near the right eyepiece, instead, the ring is placed on top of the eyepiece. Diopter adjustments are nice and tight so there’s no need for a lock. The ocular lenses come in at twenty-three millimeters in diameter which is nice and large. The objective lenses are forty-two millimeters in diameter and are located approximately sixteen millimeters from the end of the barrels. The deep-set design provides the lenses with added protection from falls, while also preventing rain, dirt, or dust from coming into contact with the surface of the lenses. The ED glass features extra-low dispersion elements, which means they offer better image quality. When used correctly they can easily decrease chromatic aberration. 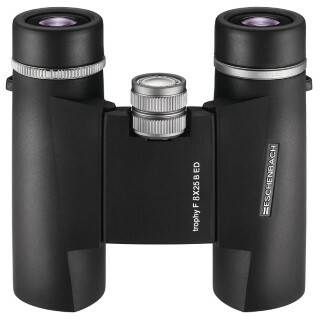 The binoculars feature the standard roof prism design. These are high quality Bak 4 glass prisms, which is exactly what you’d expect to find on binoculars in this price range. These are fully multi-coated lenses that come with an anti-reflection coating. The coating will make a huge difference in the binocular’s brightness. The phase correction coating will further improve brightness and image clarity. An issue with roof prism design is that one prism surface won’t reflect all the light that it hits. In order to remedy this issue, a highly reflective material has been added to the surface of the lens in order to ensure the highest image quality possible. The Trophy compact binoculars can be used for a wide range of applications including hiking, sightseeing, birding, and hunting. They’re lightweight, so they can also be the perfect addition to your pack or purse, allowing you can take them with you wherever you go. The uncomfortable eyecups can make it difficult to hold the binoculars up to your eyes for a longer period of time like you would when birding. Ultimately, it’s a fair tradeoff for the sheer quality of the lenses. These binoculars received a rating of four out of five stars.